Nip-sensitive cats will go crazy for Trish & Aidan Iriye-Robson's handmade, catnip-stuffed toy taco. Crazy for tacos? Si, but we bet you've never flipped over, rolled around, rubbed against, and drooled over one of them. (Not that there’s anything wrong with that.) 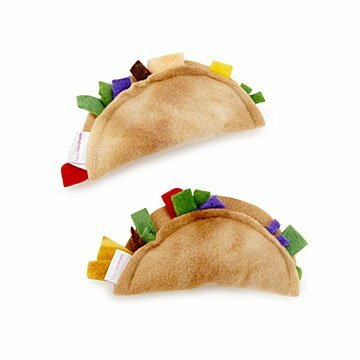 Featuring a handsewn fleece taco shell stuffed with colorful bits of faux lettuce, cheese, tomato, and cabbage, Trish and Aidan Iriye-Robson’s handsewn taco toys, stuffed with organic catnip, will bring cats to temporary ecstasy. A little 'nip adds excitement to a day of naps. Set of 2 tacos. Handmade Vallejo, California. The A+ approval from 5 cats! My cats are obsessed with these! I have to always make sure I can find the other taco because they always fight over them! Between my roommate and I we have 5 cats and every single one of them love this toy! There is some strong catnip in those tacos! Both of my cats love this toy! My cat loves these "tacos"
My cat loves her new tacos - as much we love real tacos :). She plays with them frequently and obviously enjoys them.